The target could help streamline regulatory barriers that have held back storage growth in the state. Energy storage could play a greater role in New York's grid overhaul, once the target is finalized. New York Governor Andrew Cuomo signed a bill Nov. 29 to create a statewide energy storage target, more than five months after it unanimously passed the legislature. 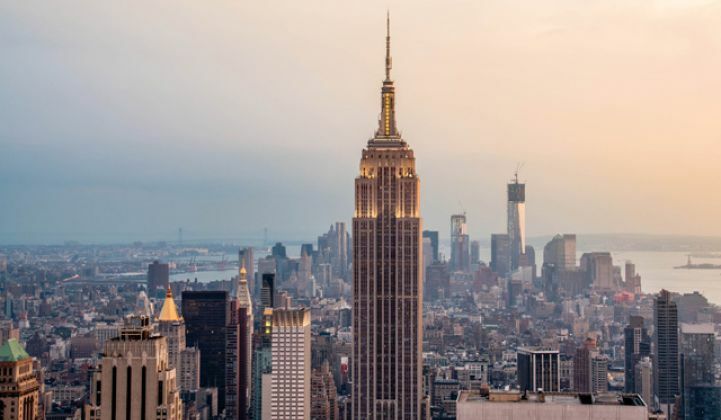 Depending on how it's executed, the target could reduce regulatory barriers to storage development and spur adoption of this technology, which stands to help New York's effort to increase clean energy and efficient grid usage. "It really creates an important market," said William Acker, executive director of the New York Battery and Energy Storage Technology Consortium. "It lets industry know that New York state is serious about opening and creating a market for energy storage." The law calls on the Public Service Commission to investigate and set a target for 2030. The original text called for a determination of the target by January 1, 2018, but that timeline is expected to be pushed back to allow more deliberation. Once set, the New York State Energy Research and Development Authority and the Long Island Power Authority will run a deployment program to meet the goal. The program must consider both customer-sited and front-of-the-meter storage, evaluating its use for transmission upgrade deferral and peak load reduction in constrained areas. NYSERDA has been working on a storage roadmap study that will form the analytical basis for the target. "They're doing good analysis work and they are engaging with key stakeholders in developing that," Acker noted. He declined to comment on the ideal size for the storage target at this time. "I don't want to get out in front of that process right now," he said. NY-BEST has previously called for 4 gigawatts by 2030. The belated signing of the bill enters New York into the small club of states with storage targets: California, Oregon and Massachusetts. California's target forced its investor-owned utilities to procure 1.3 gigawatts of storage by 2020, and is widely credited with jump-starting the industry there. The state has seen job growth from a cluster of storage startups, and benefited from a rapid-response battery deployment that shored up the Southern California region's grid after the Aliso Canyon natural gas leak. Oregon chose a decidedly humble goal of 5 megawatt-hours for its major utilities, and has seen little development so far. Portland General Electric recently proposed building 39 megawatts, however, which maxes out a cap set in the target. Massachusetts chose 200 megawatt-hours by 2020, after the state released a study that found 600 megawatts would be economically beneficial and politically feasible. The impact of a storage target, then, has more to do with the ambition of the target than the simple act of setting one. "Mandates tend to ease up regulatory barriers, as now the onus will be on utilities to find ways to deploy these systems," said Ravi Manghani, storage director at GTM Research. "If anything, this signing will provide New York state a definitive market floor." That's significant, because the regulatory landscape has posed a barrier to storage growth thus far. New York's Reforming the Energy Vision initiative includes a mandate for 50 percent renewable energy by 2030 and aims to reward utilities for investing in the grid more efficiently. So far, it hasn't produced final tariffs to compensate storage for the locational value it provides to the grid. Meanwhile, the New York City Fire Department has yet to finalize a permitting procedure, as it studies the safety impacts of lithium-ion batteries in the city. That has blocked much development, even though the city has an acute need for local capacity, which will only grow when the Indian Point nuclear plant shuts down in 2021. Cuomo's Energy Czar, Richard Kauffman, expressed doubts this summer that picking storage as a solution best serves the goals of REV. Cuomo did not jump at the chance to approve the bill. In the intervening months, though, the governor evidently reached a place where he felt comfortable allowing the target to move ahead.